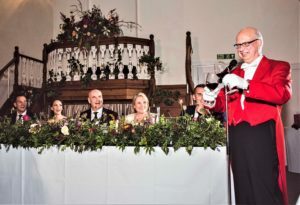 A Toastmaster / Master of Ceremonies has the management skills, tact, experience and expertise to ensure the success of any function, be it a wedding or other family celebration, civic or corporate event, or charity and fund-raising event. A Toastmaster / Master of Ceremonies will consult with you on every aspect of your function, advising on procedure, timing and protocol. He will take your agreed plan and make it work on the day; he will ensure that everything runs smoothly and on time, and that announcements and introductions are made using the appropriate etiquette. A Toastmaster / Master of Ceremonies in his hunting pink livery lends gravitas and style to your wedding. He will liaise with the Function Manager, the photographer, other suppliers and his watch throughout the day, relieving you of most of the stress and leaving you free to relax and enjoy the occasion alongside your guests. After several months of planning and preparation, this is the day when you want everything to be just right. It is very tempting to cut costs and ask a member of your family or a friend to act as your Toastmaster. This is one time when it really pays to have an experienced Master of Ceremonies to guide you through the pitfalls rather than ‘winging it’ on the day. As a Fellow of the Guild of Professional Toastmasters, John has been trained to the highest standards of the Professional Toastmasters’ Academy. He has an eye for detail and a light touch to ensure that your function is enjoyable and memorable for all the right reasons.